We've had a number of questions from folks who would like to copy this guide. As with the rest of the ProQuest guides, please do feel free to copy this guide! If you are having problems finding this guide, steps and screenshots are below. Our guides at Proquest.libguides.com are part of the US cluster (hosted by Springshare). Springshare has moved sites to server clusters on other continents and that may affect your ability to copy content. For institutions falling into either of these categories, you will need to copy and paste the content. CLICK your Home link in the orange menu bar. SCROLL down the page looking in the middle column for your list of LibGuides Shortcuts. Next, CLICK on the box to the right of Choose Layout or Reuse, the pulldown will be activated. SELECT the option to Copy content. CLICK: on the Radio Button Community Guides. 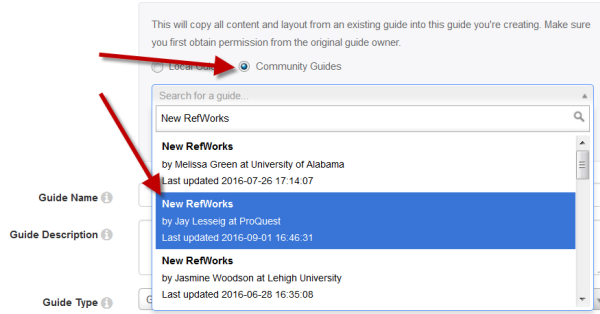 SELECT: New RefWorks at ProQuest. << Previous: Welcome to the New RefWorks!